Ugly and leathery-brown, the cane toad is one of Queensland’s best-known pests. 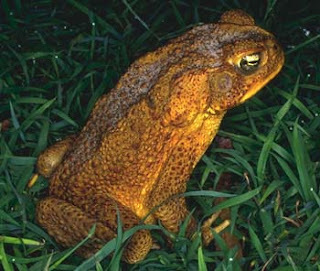 Compared with native frogs, the cane toad is heavily-built and large (up to 20cm). Colours range from brown to mustard, with its underside varying from white to yellow mottled with brown or grey. Its head and face, with a distinctive ridge over each eye, are unlike any Australian frog. But cane toad tadpoles are similar to some native frog tadpoles. When threatened or handled, the toad releases a toxin from these glands that is highly poisonous to native animals and most domestic pets. The cane toad can squirt the milky toxin from its glands up to one metre away. Animals often die if they swallow cane toad toxin. Originally from South America, the cane toad has been introduced to many countries as a biological control agent for agricultural insect pests. Only 10 years later, the toad was in Brisbane and has now spread south and west to areas where cane has never been grown. Combined with this is a long life; a cane toad has lived 16 years in captivity. Wij hebben de folder thuis nog liggen uit Nothern Territory. Als je er een ziet: vangen, in een zak stoppen en heel hard ermee ronddraaien en slaan!